We all know that school librarians make a huge difference for student achievement and well-being, but sometimes this fact gets overlooked. So for those moments when you need to prove your worth (hopefully these moments are few and far between), we’ve collected articles and impact studies so that you have them at your fingertips whenever you may need them. We have housed them at our MonroeOneSLS libguide on the Professional Resources page. If you have any that you would like to add, please send the info my way at liesl_toates@boces.monroe.edu. For additional lists of articles and studies, check out the Library Research Service and the Antioch University School Library Research LibGuide. Click to view all of our Tutor Clips. Introducing: Monroe One Tutor Clips! Our Multimedia department has been busy making short, easily accessible tutorials for educators using our Multimedia service. So far, Monroe One Tutor Clips include overviews of Safari MONTAGE and Soundzabound, as well as how to use Soundzabound on an iPad. More are already in the works. Educators can access the Monroe One Tutor Clips by visiting the iMedia website (www.monroe.edu/imedia) and clicking the Tutor Clips link to the left, or at the Tutor Clips site directly. Did you know that Soundzabound has sound effects too? Check out our video showcasing some of them! Last week, the next episode of Dewey Decibel came out, and guess what? Spring is in the air… It’s about weeding! If you have about a half hour, the episode is worth the listen. Do you think you could represent the title in an artistic way using food? Last week, Gastro Obscura came out with an article about Edible Book Festivals where people do just that. Can you think of other ways to represent your favorite book title in an artistic way? Maybe your students can! On Friday we posted about weeding and about how keeping your collection clean can help your students to find quality, up-to-date resources. Today we look at two extremely popular weeding methods. Of course, first, you should be aware of your library’s collection policy and whether it lists criteria to consider when weeding. CREW: Texas State Library and Archives Commission, out of Austin, Texas, put together this very widely used weeding manual, (CREW stands for Continuous Review, Evaluation, and Weeding). This manual outlines why, how, when, and how much to weed. It also includes a checklist of weeding factors. Criteria starts on page 15 and asks you to consider (among other things) the needs of your patrons, the usefulness of your items, and the availability of similar items in a digital format. FRESH: Jennifer LaGarde, a.k.a. 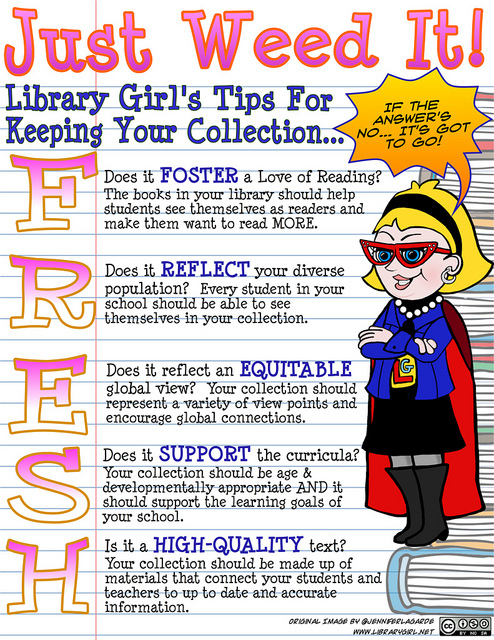 Library Girl offers tips for keeping your collection “fresh”, and this is specific to school libraries. What a gloriously uplifting term! What it really means? Whether you’ve just inherited an old collection, you haven’t had the time to look at your catalog, your administrator or school culture doesn’t like to get rid of books, or you have difficulty making those difficult decisions yourself, you most likely have a collection that needs to be weeded. It’s a struggle that School Librarians face continuously. As we purchase new materials, we need to consistently weed out old materials. Therefore, we’ll be writing a couple of posts in the next few days that provide information vital to keeping your collection up to date, easy to navigate, and useful for your students. Today we’re going to start with WHY? Weeding helps to keep the information in your collection up to date and relevant. Students will be better able to find the books they want or need. If you don’t weed, you will eventually run out of space. A clean, weeded library shows that the librarian cares about the collection and the patrons who access it. Yes, we know you already know all of this. But sometimes it’s difficult to put into action, and sometimes it’s even more difficult to convey it to others. So here are some articles you can share when you need to convince someone else. Most importantly: Before you dive into a full-blown weeding session, make sure you know your school policy on removing library resources from the collection. We hope these resources are helpful to you. April is (among other things) Autism Awareness Month. PBS has a number of valuable programming for this purpose. Check out the following programs and use the request form for a recording. POV #3011 “Swim Team” – Parents of teens on the autism spectrum form a competitive swim team, training them with high expectations. Follow the rise of three athletes as the film captures a moving quest for inclusion, independence and a life that feels like winning. Spectrum: A Story of the Mind – Take a journey into the rich sensory experience of autism. Imagine a world where words taste and thoughts feel, where sounds swell with color and leaves on trees change tones visible to the naked eye, and where eye contact with another can cause physical pain. Spectrum: A Story of the Mind explores autism through the lens of diverse characters on the spectrum. Airs 4/6 at 1:30 p.m.
America Reframed #514 “Deej” – the story of DJ Savarese (“Deej”), a gifted, young writer and advocate for nonspeaking autistics. Once a “profoundly disabled” foster kid on a fast track to nowhere, DJ is now a first-year college student who insists on standing up for his peers: people who are dismissed as incompetent because they are neurologically diverse. Will Deej be able to find freedom for himself and others like him? Airs 4/13 at 10 p.m.
Autism: Coming of Age – In the next 10 to 15 years, an estimated 800,000 children with autism will age out of the school system and transition into adulthood. Then, they will look to ill-prepared state and federal governments for the support services and resources to meet their many needs – a situation autism experts refer to as the “coming tsunami.” The one-hour documentary AUTISM: COMING OF AGE provides an inside look at the lives of three adults with autism and includes interviews with their families and support teams. Autism and disability experts from Massachusetts, New York, Washington, Virginia and Pennsylvania also discuss the current system, impending challenges and possible outcomes for the future. Airs 4/13 at 11 p.m.
Keep checking the Offair Listings portion our blog throughout the month as we post more information and links to request these. Ohio University professor M. Laeeq Khan published a new study in the journal Behavior and Information Technology, which found that media and information literacy is the biggest factor in recognizing misinformation online and in the media. The study is titled “Recognise misinformation and verify before sharing: a reasoned action and information literacy perspective”. Use the widgets below to filter our posts by category or search for a specific title. To see older posts, use the archives to look through each months posts.